In the preceding formula, Dn is the normalized distance, R is the light's range, and D is the distance, in world space, from the light source to the object surface. A normalized distance is 1.0 at the light's source, and 0.0 at the light's range. In this attenuation formula, A is the calculated total attenuation and Dn is the normalized distance from the light source to the object. The constant, linear and quadratic attenuation factors act as coefficients in the formula. You can produce a wide variety of attenuation curves by making simple adjustments to them. 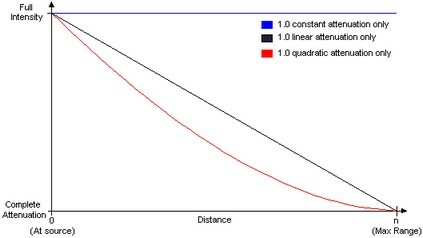 Most applications will set the linear attenuation factor to 1.0 and set the remaining factors to 0.0 to produce a light that steadily falls off over distance. Similarly, you could apply a constant attenuation factor of 1.0 by itself to make a light that doesn't attenuate (but will still be limited by range). The following illustration shows the three most common attenuation curves.